I have no idea why it took me so long to try a Spanish tortilla, made from leftover potatoes. I've been thinking about it every now and then, but I guess I thought it'd take longer than it did, or be more involved. And I was a little afraid of the flipping part, which turned out to not be a problem at all. 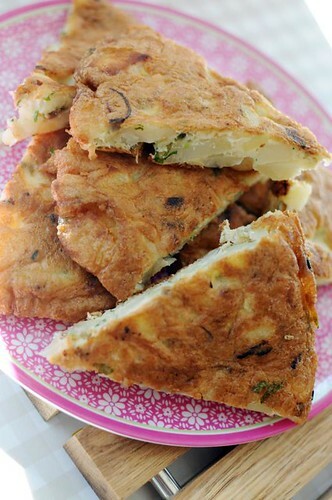 The tortilla is lovely as part of a fingerfood spread, or to bring on a picnic. My two-year-old loves it. Coriander haters can leave that out. Me, I'd rather leave it in. A lot of it. Start by frying the potatoes and onions in some oil for a few minutes. It should color a little, and become heated through. Crack the eggs into a large bowl, and whisk together with a pinch of salt. Add the coriander, and the potatoes and onions. Heat plenty of oil in a fairly small frying pan (8 inch). Add the batter when the oil is really hot, and immediately lower the heat. Fry the tortilla on low heat, for 10 minutes on each side. I didn't know coriander-haters were allowed their own club! This looks good! Yum! Thanks Anne! Anne - I love tortilla espanole. I, too, had issues with flipping (runny egg mixture down my arm, etc.) and took the easy way out. I took the frittata technique and stuck it under broiler to finish the top side. So much easier. I would then flip the complete tortilla on the plate. I also grated a clove of garlic and sprinkled sea salt in the egg batter (some recipes called for onions which seemed too sweet for my taste). Your tortilla looks great but here in Spain we never use coriander (in fact is quite unusual to find it at the supermarket). We use parsley mainly in our recipes, coriander is more a cuban/south american thing but you know, sometimes people thinks that spain is next to mexico, lol. Also the potatoes are 'boiled' in a large amount of olive or sunflower oil at low temperature for 15 min or until the potatoes are soft. That's the truly tortilla spanish style. Onion is optional, but i like that subtle flavour. For the flipping problem we have this kind of frying pans. A big hug from Spain!! Ooh, thank you for that Magenta! For me, it's a great way to use up leftovers, and I've add different things each time. Coriander was great though - I know it's hard to find in Spain (having tried every time we're there - sometimes succeeding), but really delicious! looks delicious, I LOVE tortillas!! Mmmmm!! I love tortilla and only made one yesterday :) I use Delia's recipe and it really is foolproof.